1984. Jinbei Koi farm – Budokubo village. 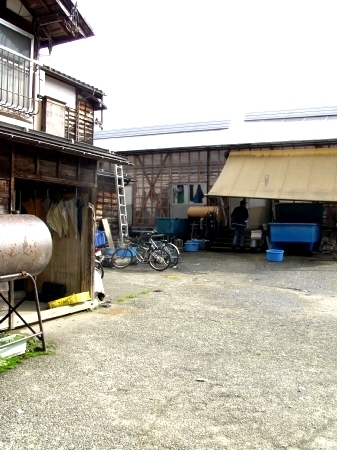 Jinbei is less than half a mile away from Choguro who first introduced me to the Watanabe family who own this farm. This outlet is famous throughout Japan in the production of the Jinbei Sanke bloodline which surfaced originally in the late 1950’s to the early 1960’s. The line of this Sanke was greatly assisted by using early Torazo Sanke blood to their parents in the mid 1950’s. Original Sanke parents used to produce the first Jinbei bloodline. 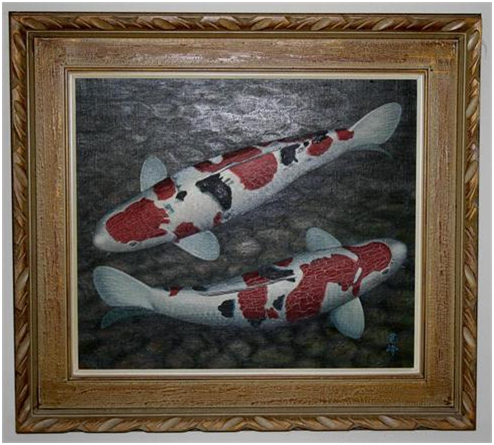 This beautiful oil painting was presented to me by the Watanabe family in 1987 when I interviewed them for inclusion in my first book ‘Koi Kichi’. The male parent is the one shown to the top of the painting. The painting should also reinforce the ‘Jinbei ‘tsubo-sumi’ pattern’ where the majority of sumi produced falls mainly on the white ground. Senichi Mano of Izumiya still uses today Sanke parents originating from true Jinbei bloodlines and insists they are the best he can locate. Jinbei is also famous in producing true jumbo Nishikigoi and his indoor and outdoor facilities in Budokubo are quite extensive. Today the son Kazumi runs the outlet still under the watchful eye of his father. My first impressions were of – ‘traditions with dedication’.